Introduction to Computer Science through Java is an introduction to computer science and programming intended for people with little or no experience. We start with the most basic concepts and are careful to define all terms when they are first used. The book presents each new idea in a logical progression. Larger topics, like recursion and object- oriented programming, are divided into smaller examples and introduced over the course of several chapters.This book is intentionally concise. Each chapter is 12–14 pages and covers the material for one week of a college course. It is not meant to be a comprehensive presentation of Java, but rather, an initial exposure to programming constructs and techniques. We begin with small problems and basic algorithms and work up to object-oriented design. 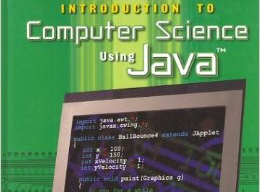 In the vocabulary of computer science pedagogy, this book uses the “objects late” approach. The goal of this course is to teach you to think like a computer scientist. I like the way computer scientists think because they combine some of the best features of Mathematics, Engineering, and Natural Science. Like mathematicians, computer scientists use formal languages to denote ideas (specifically computations). Like engineers, they design things, assembling components into systems and evaluating trade offs among alternatives. Like scientists, they observe the behavior of complex systems, form hypotheses, and test predictions.The single most important skill for a computer scientist is problem-solving. By that I mean the ability to formulate problems, think creatively about solutions, and express a solution clearly and accurately. As it turns out, the process of learning to program is an excellent opportunity to practice problem-solving skills. That’s why this chapter is called “The way of the program.”On one level, you will be learning to program, which is a useful skill by itself. On another level you will use programming as a means to an end. As we go along, that end will become clearer.